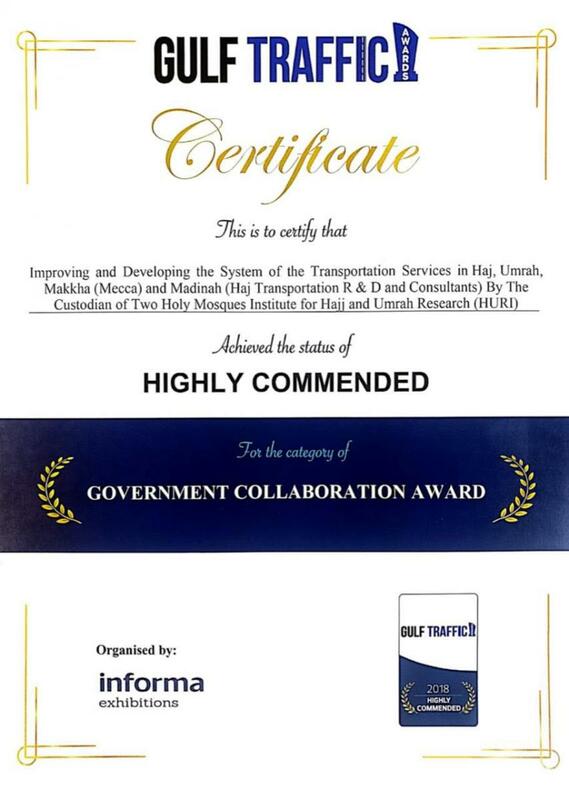 The Custodian of the Two Holy Mosques Institute for Hajj and Umrah Research participated in the "Gulf Traffic Awards". These awards concentrate on the most outstanding achievements and projects in the field of transport. 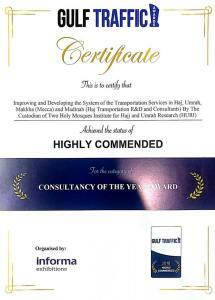 In addition, the Institute has been placed on the short list of the Middle East's leading transport consultants. The Institute was also awarded two certificates that recognized the establishment as one of the most prominent participants in the "Gulf Traffic Awards", which was held last December (2018) in Dubai, UAE. The directors of the award rated the consultant services of the Institute, for improving and developing the pilgrims' transportation system in Makkah, Madinah and the Sacred Sites, among this year's prominent short-listed contributions presented by central consultants in the area of transport and government cooperation.